Clinical and cubic: certainly not the first words that spring to mind when espousing the virtues of meat-free cuisine. 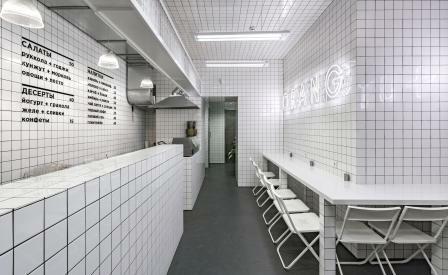 Yet, beaming from within on a dark street in Kiev, this would be the most apt way to describe Orang+Utan Vegetarian Bar. A collaboration between local outfit, AKZ Architectura and owner Yulia Savlepova, the all-white restaurant literally serves as a blank canvas for the vibrant plant-based dishes served up from its bar. The visual concept was the idea of Savlepova, who conceived the idea of a pure, minimal refuelling stop as a respite from the ‘urban jungle’ of Kiev. On that note, AKZ’s Artem Vahrin and Katya Zuieva blanketed the 60 sq m space — from the walls to the roof — with square white tiles, designed by Ukrainian brand Atem. It’s in part a tongue-in-cheek throwback to Soviet-era design, when the same type of white tile was applied to hospitals, shops and pools; the laboratorial aesthetic is further compounded by white tubular fluorescent lighting, and white fittings and fixtures crafted in Ukrainian workshops. And yet, even juxtaposed against the building’s 20th century façade, it all works. The coolness is broken by bundles of artificial pink fruit, an assemblage of green plants creates a lively pop, and the grid-like formation of the tiles simultaneously frames the menu, listed on the wall, and offers a hypnotic distraction from the urban jungle beyond.